Prawer Plan Scrapped – How Will the “Bedouin Problem” be Solved? 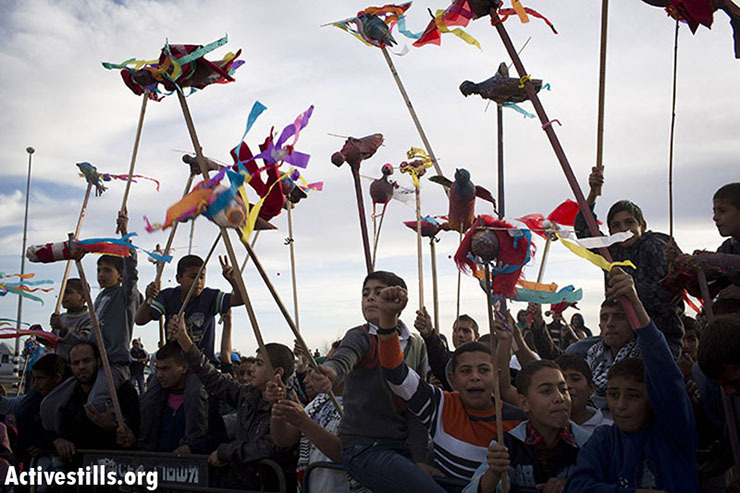 Children protest against the Prawer Plan during a “Day of Rage” demonstration in the Negev town of Hura. Received the wonderful news yesterday that Israel’s Prawer-Begin Plan – a bill which would forcibly relocate over 40,000 Israeli Bedouin from their ancestral lands – was just scrapped by the Knesset. This is huge on a number of levels. Most importantly, it’s very welcome news for the tens of the thousands of Bedouin who were facing an unjust eviction and transfer from their homes. Up until relatively recently, in fact, the passage of Prawer seemed virtually assured. But as I mentioned in my last post, Knesset support began to unravel when Benny Begin, the co-sponsor of the bill, revealed that he had never even shown the plan to the Bedouin – putting to lie the widespread claims of government officials that the majority of Bedouins had approved of it. After revealing a map of the actual plan, the Knesset’s right wing attacked it, claiming it actually allocated too much land to the Bedouin (even though it would have taken 61,700 acres from them and resettled them in a compound totaling 42,000 acres.) Feeling the pressure from both sides, the government was forced to scrap their plan entirely. As I’ve followed this issue, I’ve found it utterly infuriating whenever I read supporters of the bill invoke a “Bedouin Problem” that needed to be solved, as if the economic and social issues facing the Bedouin were somehow of their own making. In truth, there is no need for a special government relocation bill to “solve” this “problem.” What the Bedouin need is for the Israeli government to officially recognize the areas in which they live so that they can finally receive basic infrastructure such as water, sewage, and electricity. They need Israel to treat them them as equal citizens, offering them full government services, to allow them to vote or run in local government elections. But they can’t, of course, because Israel desires to create more facts on the ground in the Negev. In other words, the real “Bedouin Problem” stems from the fact that the Bedouin are not Jewish. While today’s news will at the very least delay the State’s plan to implement the largest displacement a Palestinian population since 1967, there is little reason for celebration. It it will only be the end of the current version, which was in jeopardy mostly due to concerns from right-wing MKs that it was “too generous” to the Bedouin. It is probable a revised bill will be drafted that will in all likelihood not be any better as far as Bedouin claims. While this may well come to pass, it is fair to say that a more restrictive bill will undeniably be met with fierce opposition from a powerful and widespread movement of solidarity that has now coalesced to support the Bedouin’s cause. And this is another reason why the scrapping of Prawer-Begin is so significant: it speaks to the growing power and influence of the Palestinian solidarity movement. Indeed, over the past several months, this movement was galvanized by Prawer-Begin, bringing together a wide coalition of organizations in Israel/Palestine and abroad. The tipping point was reached two weeks ago during the “Days of Rage” protests, in which hundreds of Palestinians and solidarity activists staged demonstrations in the Negev town of Hura as well as Haifa, East Jerusalem, Ramallah and Jaffa. Simultaneous protests took place throughout the world in London, Berlin, Rome, Istanbul, Cairo and in the US. There is a very real movement growing, and it is slowly but surely chalking up significant victories for the cause of justice in Israel/Palestine. This entry was posted in Human Rights, Israel, Jewish Voice for Peace, Palestine on December 13, 2013 by Rabbi Brant Rosen. From the many sources that I have seen the so called Bedouin Problem the so called plan to remove these people. may only become a worse problem for them .I see no real movement and exactly the opposite for the Israeli Government from tearing this communities basic human rights being honored. I’d like to thank you for bringing this information to my attention.